By 1913, the Mexican Revolution was well underway. President Madero had been assassinated in February under orders from the brutal General Huerta, whose own presidency would survive little more than a year. “Pancho” Villa controlled increasingly larger parts of the north while Emiliano Zapata extended his reach in the south. In America, newly inaugurated President Wilson, uncertain of which faction to support, announced to Congress in August his passive policy toward Mexico of “watchful waiting”—and continued to embargo arms exports to the country. In September, in sparsely populated Texas southeast of Big Bend, a Carrizo Springs former sheriff, Eugene Buck, and his Mexican American deputy, Candelario Ortiz, found themselves caught in the complex militancy of the times. Word reached them of a group gathering rifles, ammunition, and dynamite from the town’s train depot. When they and two other lawmen caught up with the would-be revolutionaries (followers of Mexico’s radical Liberal Party, whose leadership and publications emanated from Los Angeles), they were still thirty miles from the border. After the ex-sheriff and deputy exhausted their own ammunition in a shootout, they were captured by the band. With their hands bound, the two were loaded with supplies and marched through the desert heat. After a few miles, Deputy Ortiz, unable to climb a steep bank, was shot to death. The posse on the trail. These and the violent subsequent events would be restaged for the camera only a few weeks later in a remarkable three-reel docudrama produced by Sheriff Buck himself—who had been freed in a tense exchange by a posse of local cowboys, before they were joined in the capture of the revolutionary group by U.S. Army cavalry troops. 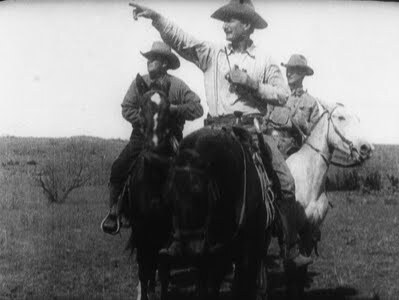 Eugene Buck, incorporating with a partner as the “Buckhorn Film Co.,” cast himself, other lawmen, and posse members to replay their roles at the original locations. For expertise and equipment Buck hired the new San Antonio-based Elk Photo Play Company, which had been making newsreels for Texas theaters since June. Convincingly presented as “an accurate reproduction” of the events of September 11-13, 1913, Ammunition Smuggling on the Mexican Border (also shown as The Dimmit County Smugglers) was being shown in moviehouses by February 1914—soon enough for one of the arrested band to sue for an injunction against it as prejudicial to jurors. 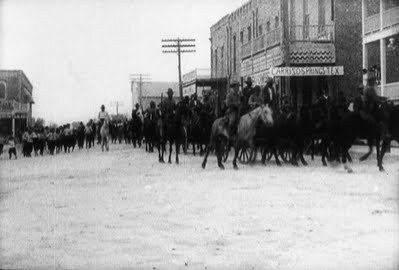 Citizens of Carizzo Springs, Texas, turn out to see the arrested men brought in wagons to the town jail. Around the film hang fascinating questions about border politics, which I’ll touch on in an introduction before the screening. 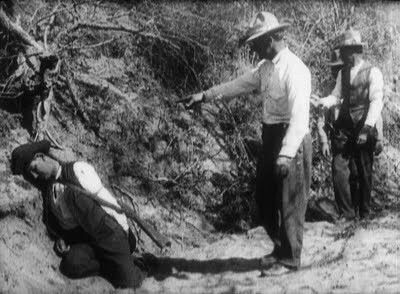 One of Eugene Buck’s motivations for making the film may have been his rough cross-examination during his kidnappers’ first trials, in October 1913, when defense attorneys cast him as a confused and unreliable witness against idealistic freedom fighters. On film he could reproduce the pursuit, the shootouts, his kidnapping, and his friend’s murder just as he had testified. Reenacting the crime on film may have been the best revenge—and a way to honor the sacrifice of Deputy Ortiz, a twenty-year police veteran and, for the era, a rare Mexican American lawman. 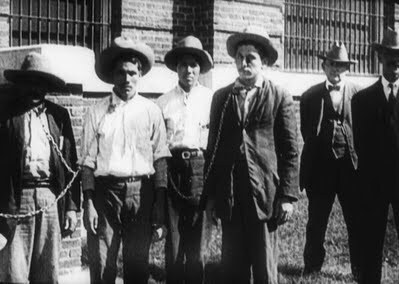 At the prison in San Antonio, from left: Lino Mendoza, Leandro Vázquez, Bernardino Mendoza, Miguel Martínez, and two lawmen. What is especially surprising about this film now is that it has been completely forgotten for more than 95 years. Our screening today is probably the first for Ammunition Smuggling on the Mexican Border since the 1910s, and not a word seems to have been published about it since its release. Such a status for such a film reminds us of how many areas of “orphan film” history still remain to be uncovered. Complete 3-reel films from the pre-feature era are among the most lost of film types—and this one proves something of a revelation. Alternate title: The Dimmit County Smugglers. Cast: Sheriff Eugene Buck, Sheriff W.T. Gardner, Reverend Bruce Roberts (as themselves). 40 minutes (at 18 frames per second). Preservation and print by the Library of Congress.